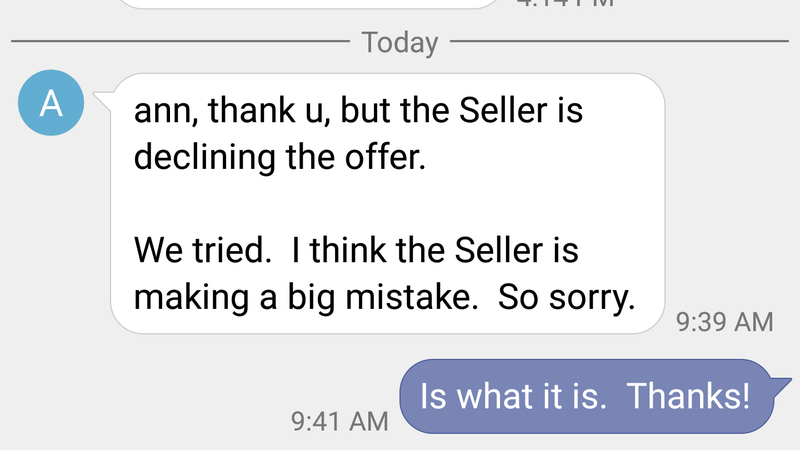 Message from the seller’s realtor is the top (what professional texts like that!?) and my realtor’s message is below that. My response is the weird purple blue thing. Another property down. The seller declined the final offer this morning. Original post continues below. Well I did everything I thought was reasonable. The rest is up to the sellers. I just submitted my “best and final” offer. Take it or leave it. To catch you up, I submitted an offer last week, they countered, I countered the counter, then they declined my counter without throwing out a new number. My final offer today was $30,000. Anything more than that and I feel like I’m going to be completely underwater when this is all done. I’m inclined to think they’re going to pass, but... you never know. Peugeot 402, for your time. Shop Quest - The Seller Countered, which is... good?